Macroglossa hemichroma Butler, 1875, Proceedings of the Zoological Society of London 1875: 243. Type locality: [Bangladesh,] Silhet [Sylhet]. Wingspan: 60--70mm. 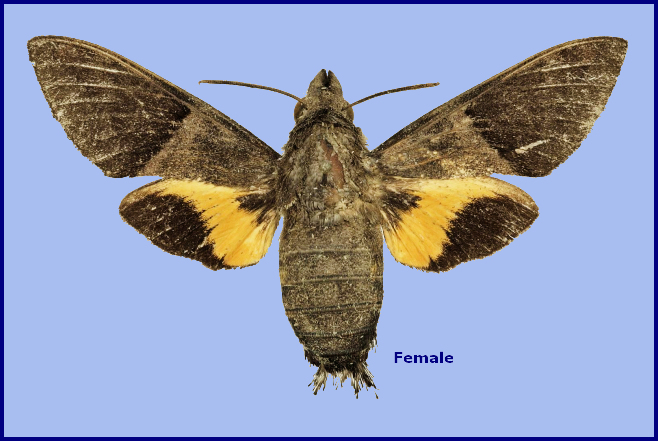 A large species of Macroglossum. Head and thorax uppersides with a dark median line. 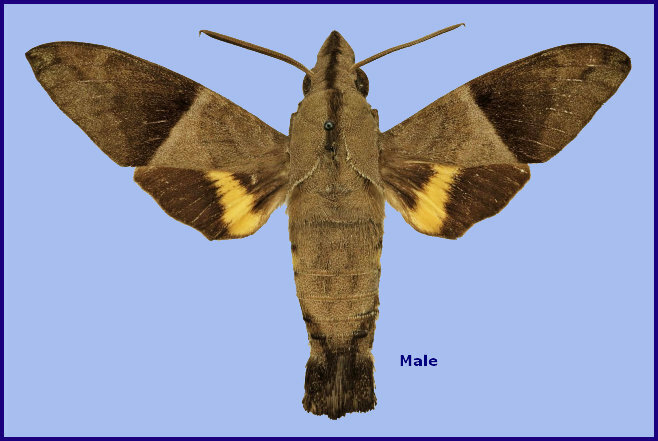 Forewing upperside sharply divided into pale proximal and darker distal parts, the dividing line running straight from the costal margin just proximal to the upper angle of the discal cell to the hind margin several millimetres proximal to the hind angle; antemedial and discal lines vestigial, the former curved, the latter almost straight, only slightly curved costad anteriorly. In the male genitalia, uncus slightly dilated apically, truncate, with angles rounded. Gnathos swollen apically, the apical edge curving dorsad, tapering mesially, the upperside transversely carinate, the mesial line elevated. Valve with stridulatory scales. Harpe ending in a very short, triangular, pointed process. Phallus with process long and slender, not denticulate, but with a single, long, basal tooth that projects distad; the pair of cornuti are short spatulate sticks, the longer one dilated into a tooth-like object. In Thailand, from February to May, and again from August to October (Inoue, Kennett & Kitching, 1997). China: Yunnan. Only recorded once, in 2013 (Pan & Han, 2018), although missidentified as Macroglossum clemensi Cadiou, 1998.